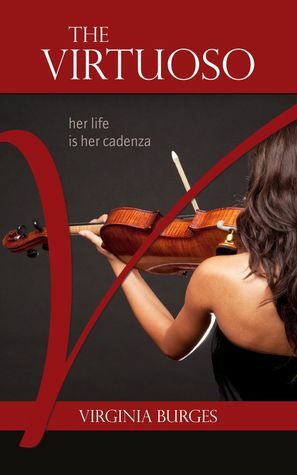 In body, and become a living soul. 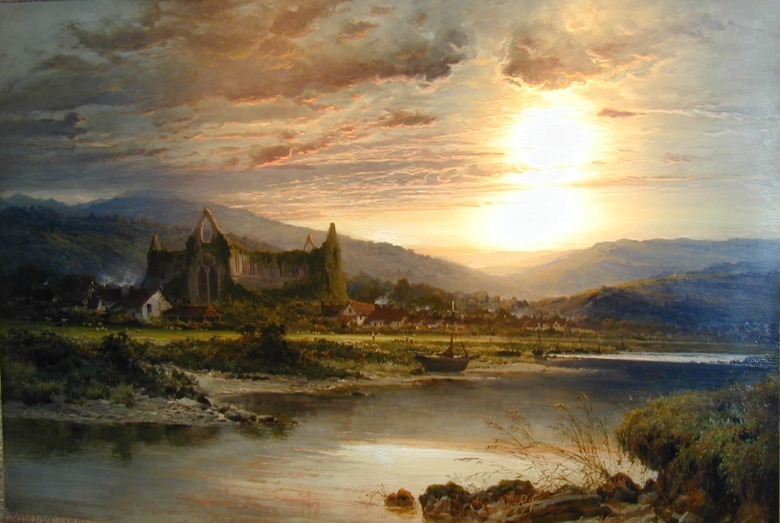 ~ William Wordsworth from Lines Composed a Few Miles Above Tintern Abbey, on Revisiting the Banks of the Wye During a Tour, July 13, 1798. Some places are sacred. Their energy flows through you and fills you with a tangible connection to the past, a gratitude for the present, and a hope for the future. 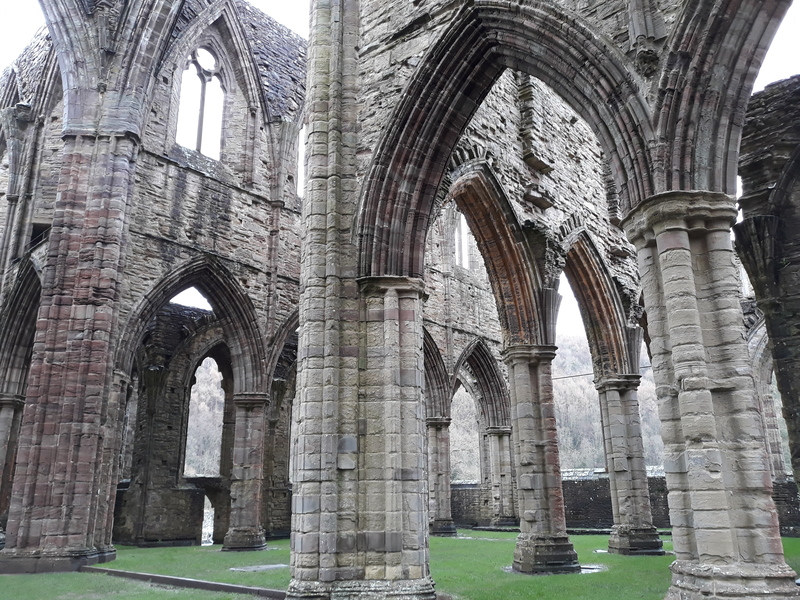 Tintern Abbey in the Welsh Wye Valley is one of those places. It’s customary to map out your goals and plans for the year ahead in January, something I advocate and do myself; but I also think it’s also good to spend some time in contemplation, and to glance back at the positives and negatives of the previous year, especially to share and savour that which nourished your soul. 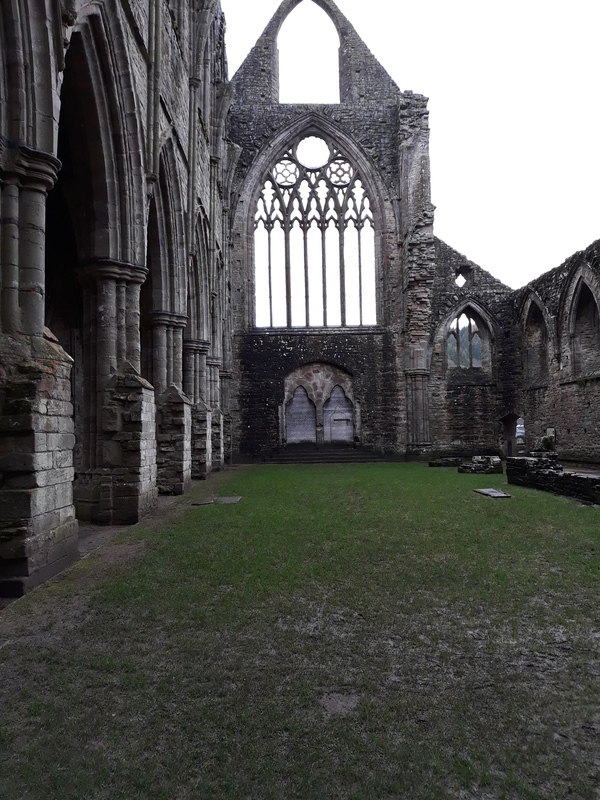 The timeless tranquility of Tintern Abbey filled me with wonder during our family visit on new year’s eve. 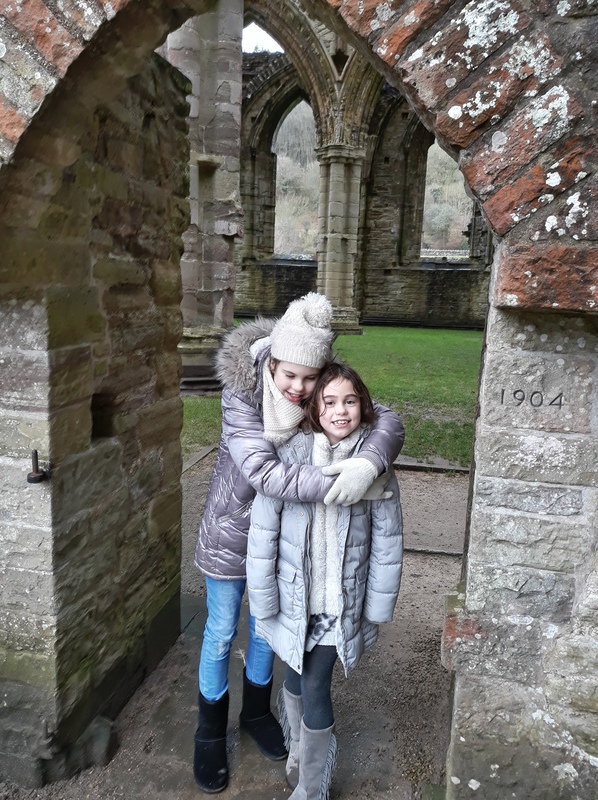 After a scenic drive through the Forest of Dean my children were keen to stretch their legs and explore. A heavy rain storm ceased abruptly before we parked, and the sky began to brighten auspiciously for our visit. Equipped with a poor choice of footwear for the muddy and quagmire like ground, we gradually lost ourselves among its crumbling and ascending ruins. 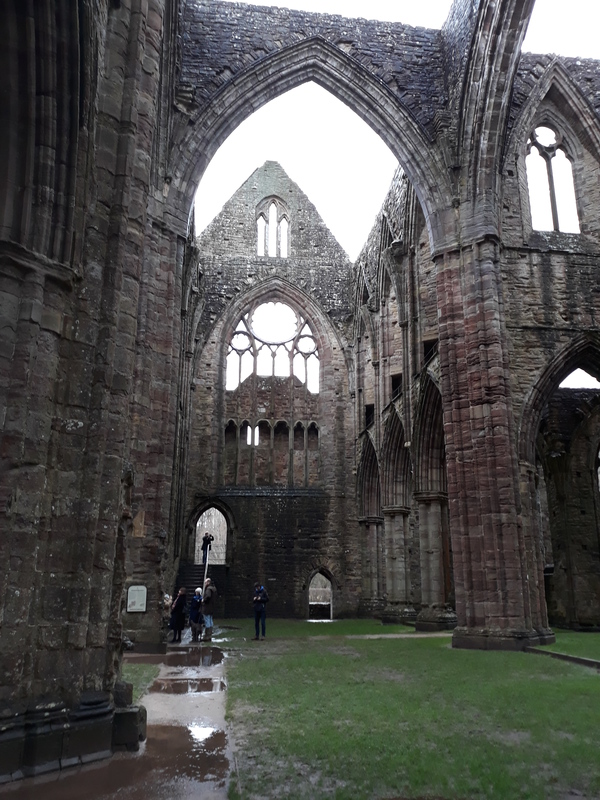 Tintern’s mottled, lichen covered, Old Red Sandstone walls, and lofty symmetrical arches, have housed and presided over numerous beings that lived simply and stoically throughout four centuries of tumultuous history. 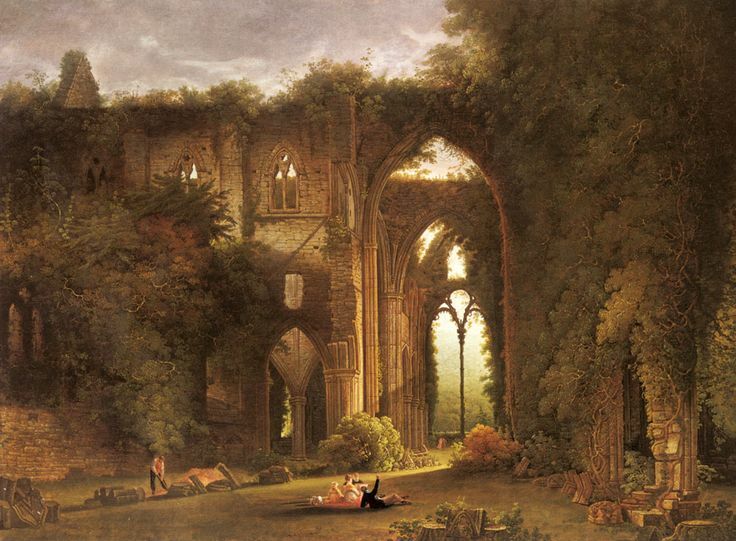 There is a sense of nobility and majesty in the fresh air that pervades its spectacular, ruinous spaces. 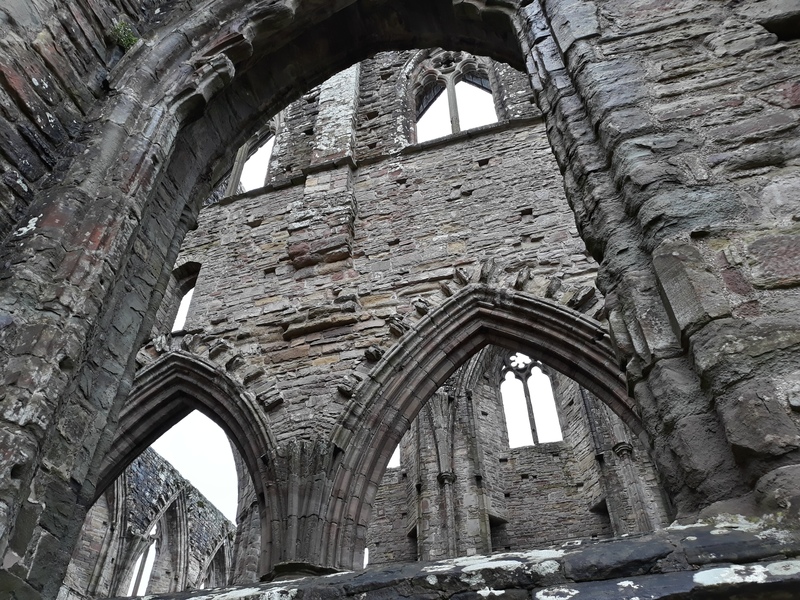 Our eyes roamed over the soaring remains of this 12th century Cistercian settlement, still standing resplendent inside a sweeping bend of the ancient River Wye, which weaves and curves like a silvery snake through the heavily wooded Wye Valley. 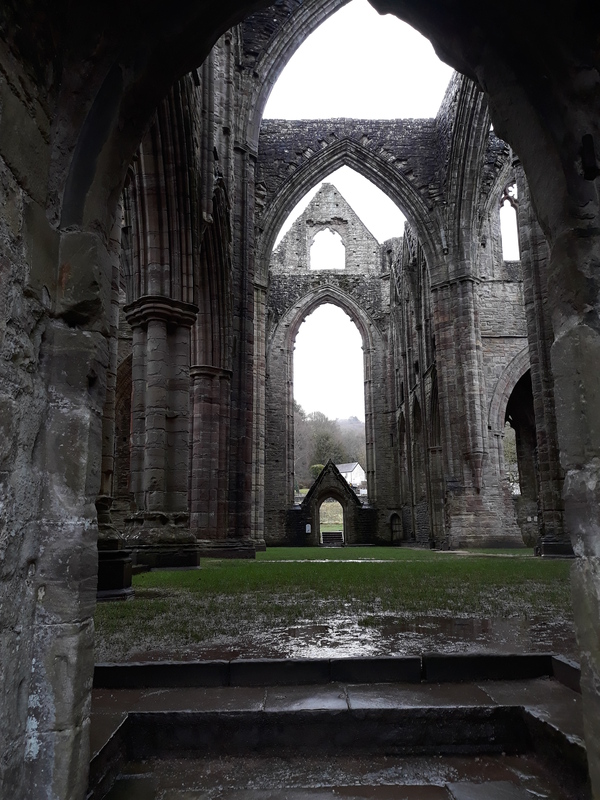 Remote, often shrouded in mist, you soon get a feeling of reverence for the architectural brilliance that has defied the elements for over 700 years. It’s not just the complexity and beauty of the buildings either, the surroundings are peaceful, pristine and primal. Any place that has been built for the purpose of devotion and worship of the divine creator carries a pure energy, a high vibration I can only describe as a sort of ‘healing’ vibe. 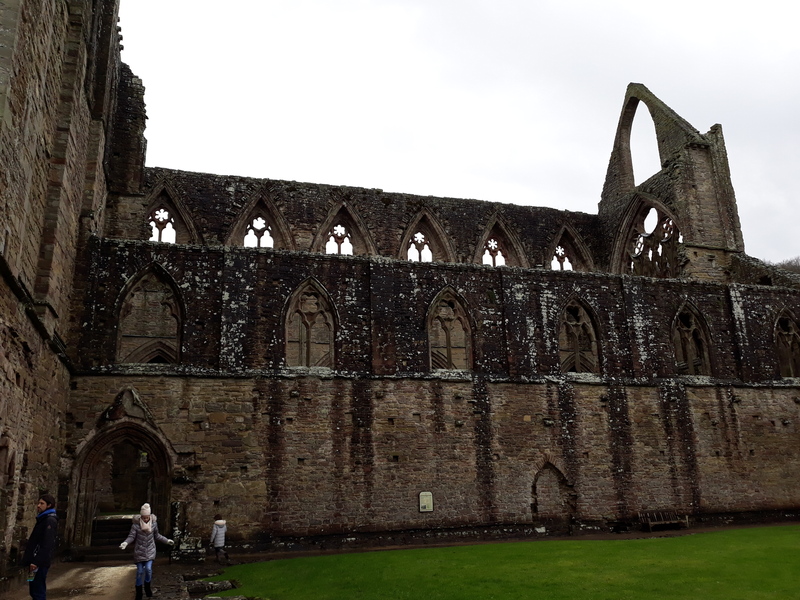 A major turning point for Tintern Abbey came when King Henry VIII ordered the dissolution of the monasteries in England and Wales (for both financial and religious reasons), after he broke with the Catholic Church in Rome. 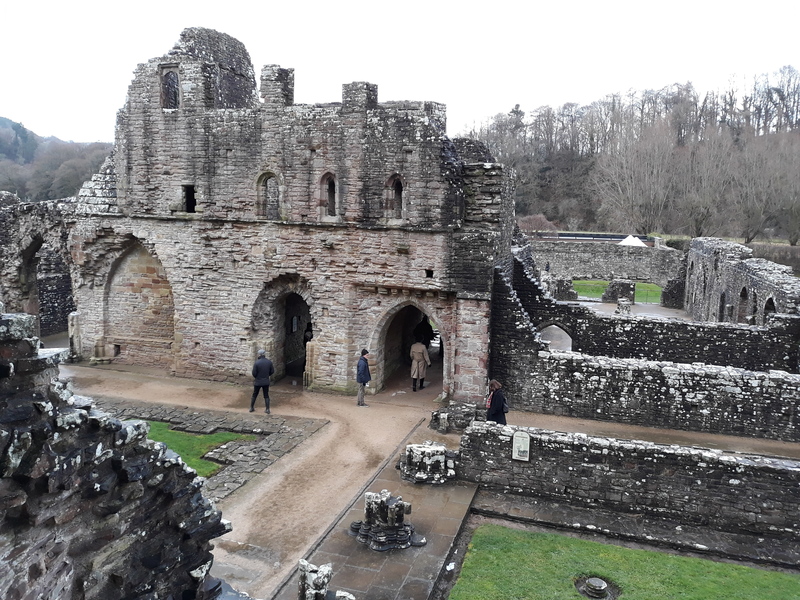 Abbot Richard Wyche and his 12 remaining monks surrendered their dwelling to the king’s men on 3rd September 1536; the defining historical moment of its decline. 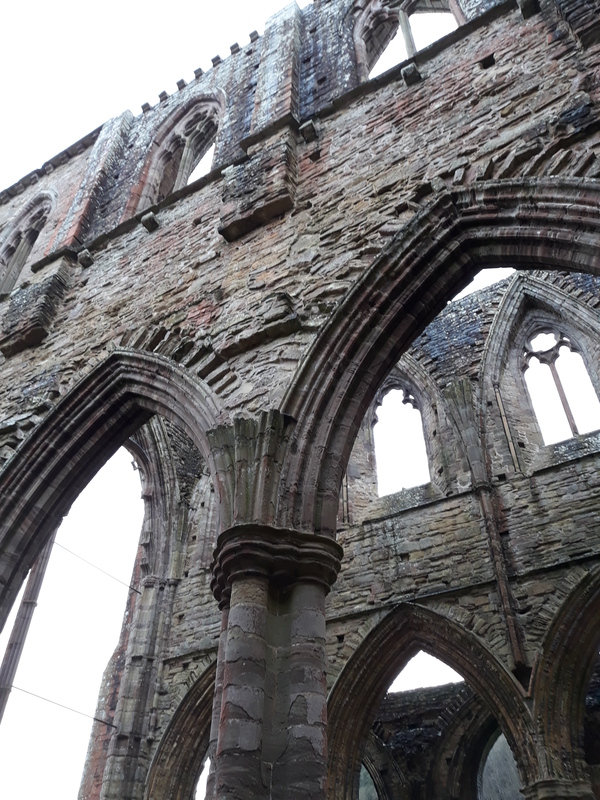 Tintern’s lead roofs were removed and sold, and the buildings systematically stripped of all valuable material. 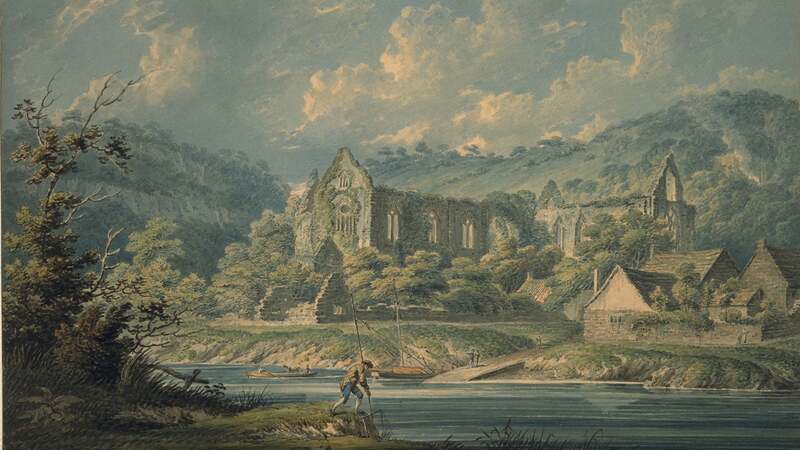 After 400 years of continuous habitation on the site by Cistercian monks, and with their peaceful home plundered – Tintern Abbey was finally abandoned. Without the attention of its dedicated inhabitants and open to the onslaught of the welsh weather, it fell into disrepair and neglect. 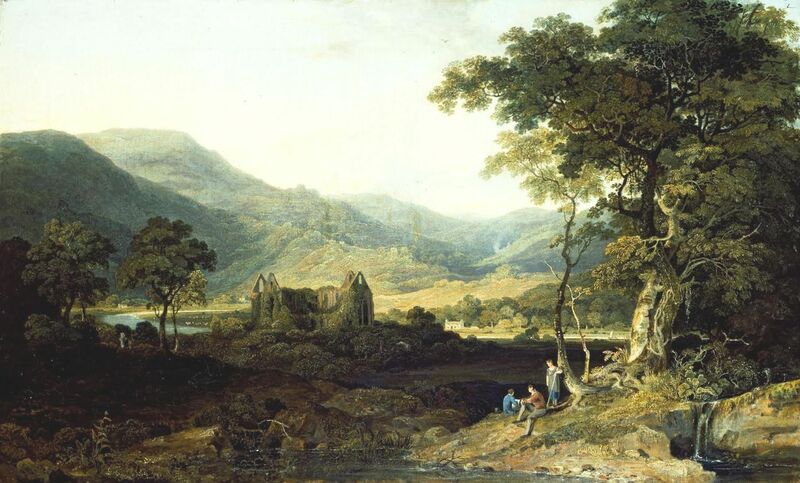 The abbey lay forgotten and slowly decaying for nearly three centuries, until it was rediscovered by fervent artists and poets in search of wild, unspoilt and romantic landscapes to inspire their art and creativity in the early 19th century. 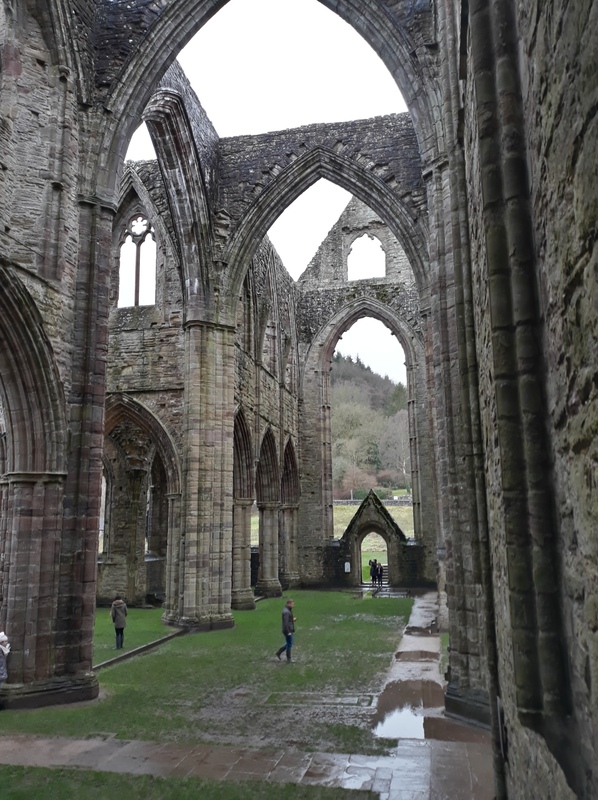 A new road to the area in 1820 made the site more accessible to adventurous and well heeled tourists, and the decaying buildings were eventually saved when Tintern Abbey was purchased by the Crown on behalf of the nation in 1901. 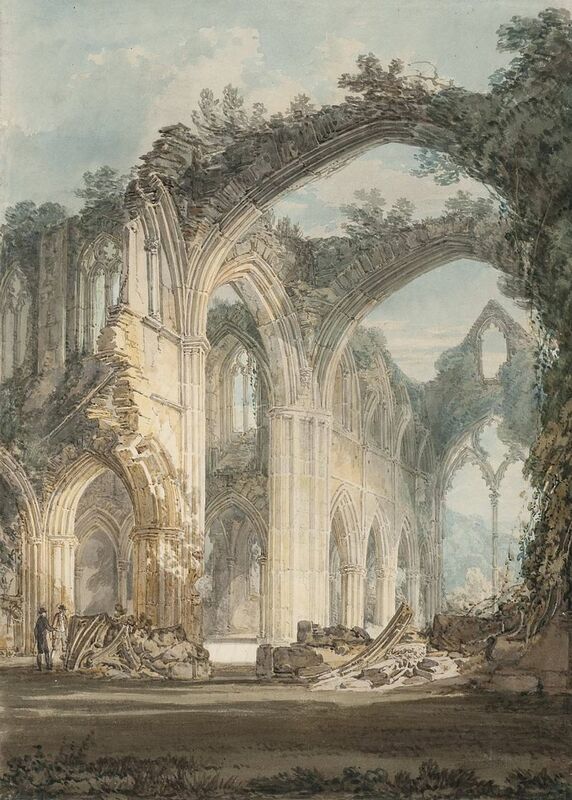 There are some wonderful watercolour and oil paintings of the abbey by Turner, Colman, Calvert, Dayes, Leader and van Lerberghe from this time period, during which its sturdy walls and pillars languished under copious ivy growth and masonry lay scattered throughout the transept. Over the next 27 years an extensive programme of conservation was carried out, as well as in later, subsequent years. 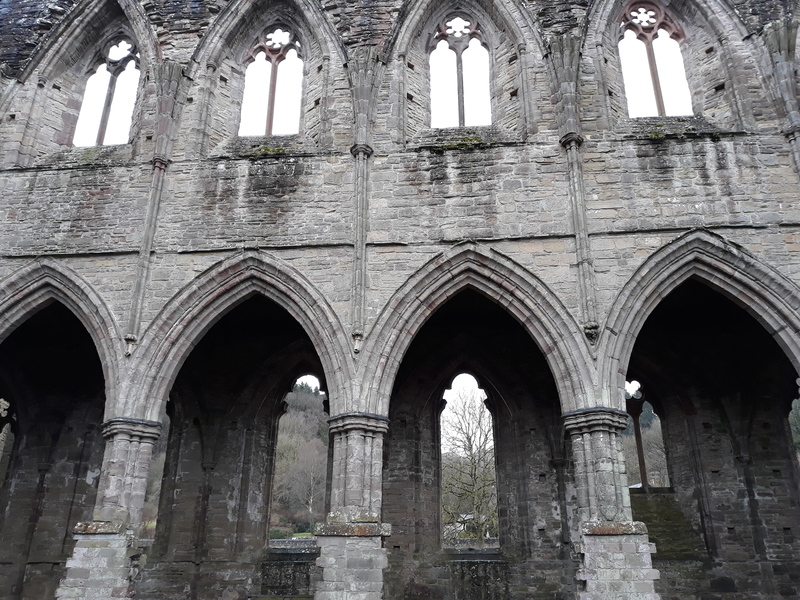 Tintern Abbey took my breath away, and I can only image the splendour it must have exuded in its medieval heyday. 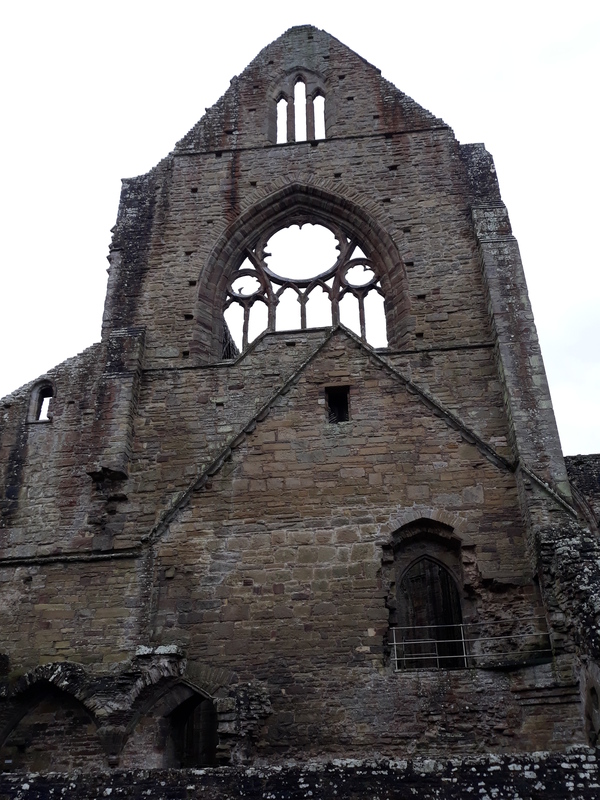 The abbey was founded by Walter fitz Richard de Clare, the Anglo-Norman lord of Chepstow, on 9th May 1131. 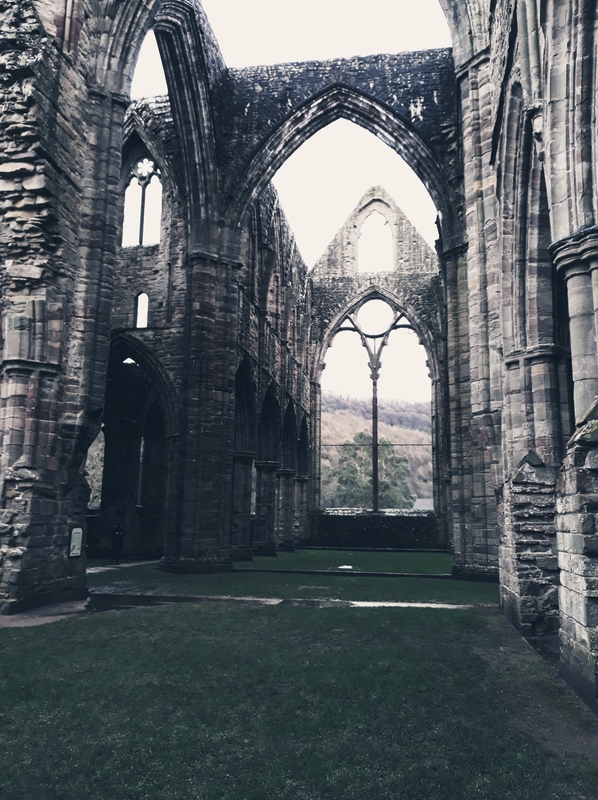 Tintern was only the second Cistercian house in the British Isles and introduced the order’s pioneering brand of monasticism to Wales. The original 13 ‘white monks’ who settled here travelled from the abbey of l’Aumone (Loir-et-Cher), itself a branch of the order’s great Burgundian ‘mother house’ at Citeaux, France. 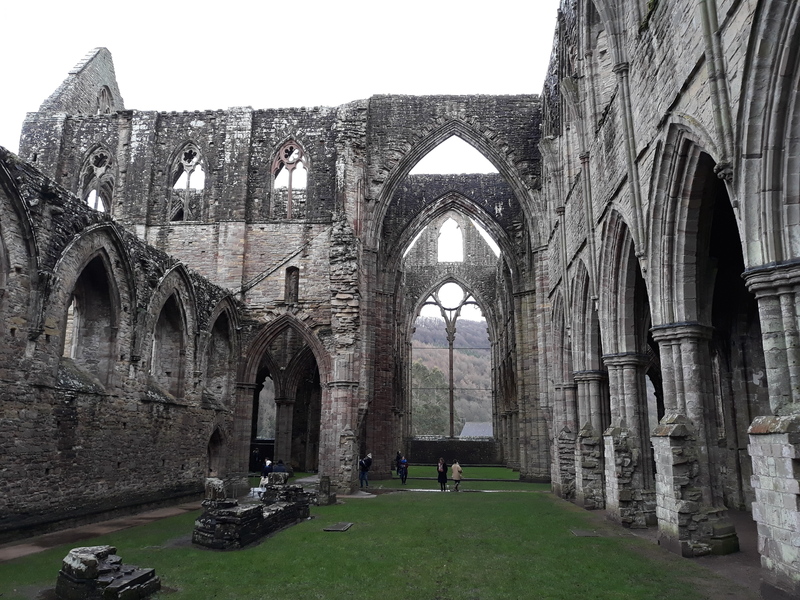 The site at Tintern was chosen in this secluded country location because it was ‘far from the haunts of men’, as was typical of those preferred by the Cistercians. 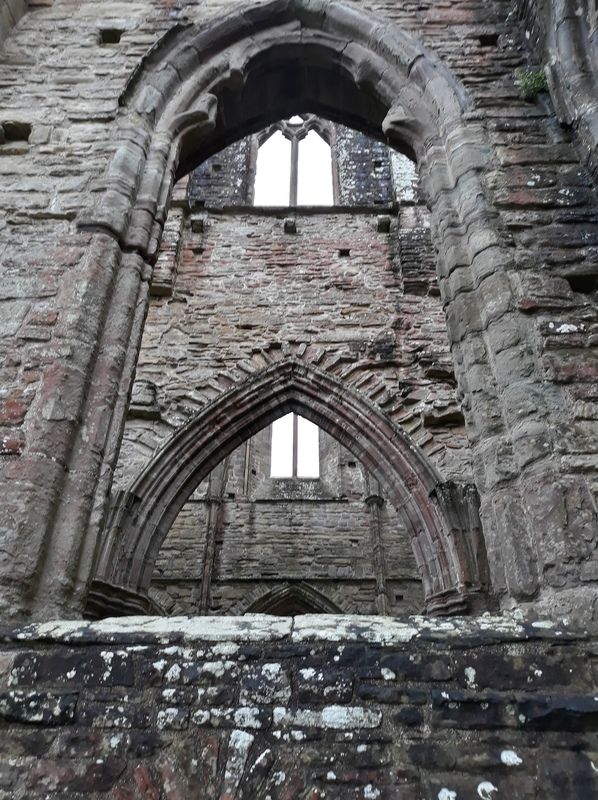 This newly formed, pioneering religious community needed land to prosper, and Walter de Clare granted the monks a substantial estate on both the Welsh and English sides of the River Wye. The land was organised into compact farms known as granges, and throughout the site’s growth in the 12th century the land was consolidated into areas for arable cultivation, the construction of farm buildings, cutting down woodland and draining coastal marsh to improve productivity. 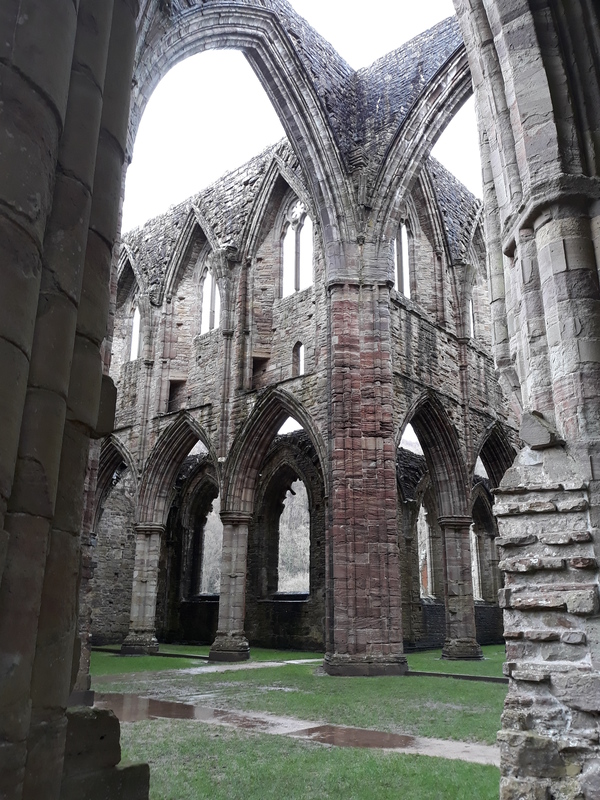 Unlike other monastic orders, the Cistercians (who had no Norman links), found much favour in Wales, and could be self-sufficient with generous grants of land from Welsh rulers. 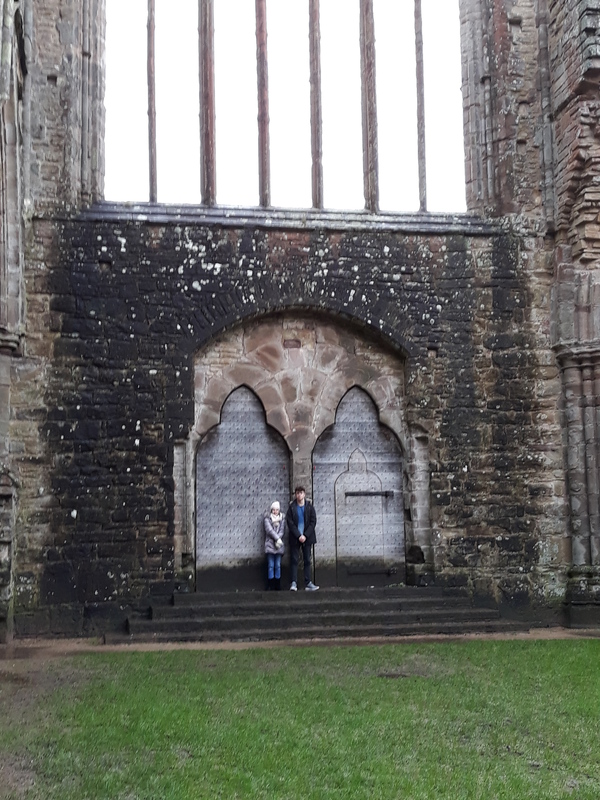 Emily and Will under the West window – the main visitor entrance during Tintern’s Medieval era. 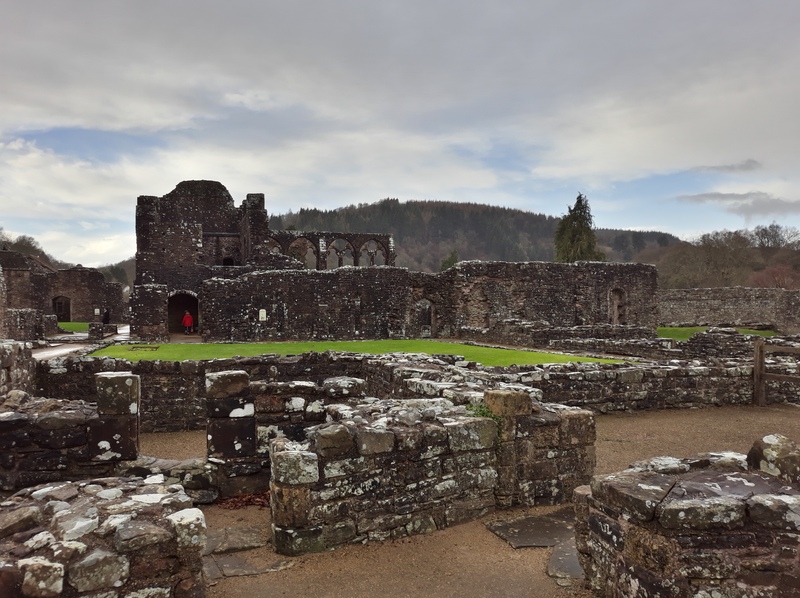 It’s thought that at first the monks lived in temporary wooden structures, but by the middle of the 12th century they had built a relatively modest stone church and monastic buildings set around a square cloister. As the community grew the monastic buildings were gradually rebuilt over the first half of the 13th century. The chapter house and refectory date from this period. 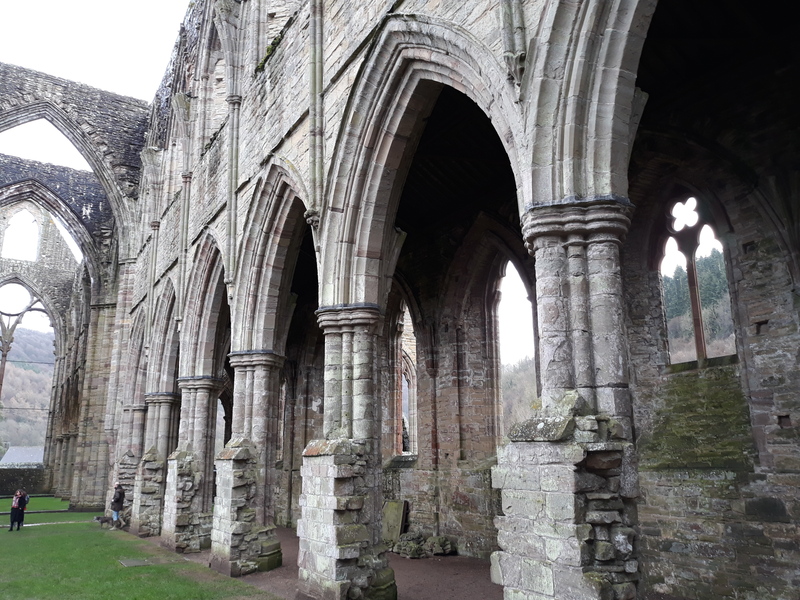 Without doubt, the abbey’s greatest glory is the stunning Gothic church which still dominates the site today, built between 1269 and 1301, when it was consecrated under the patronage of Roger Bigod, Earl of Norfolk (1270 – 1306). The great church is 228 feet long and 150 feet wide. The tall east window’s original stained glass contained the 5th earl’s coat of arms in gratitude to its benefactor. Unsurprisingly, the numbers of lay brothers fell during 1348-49 when the Black Death struck England and Wales. We walked around the foundations and low walls of the infirmary, which was almost as large as the church. 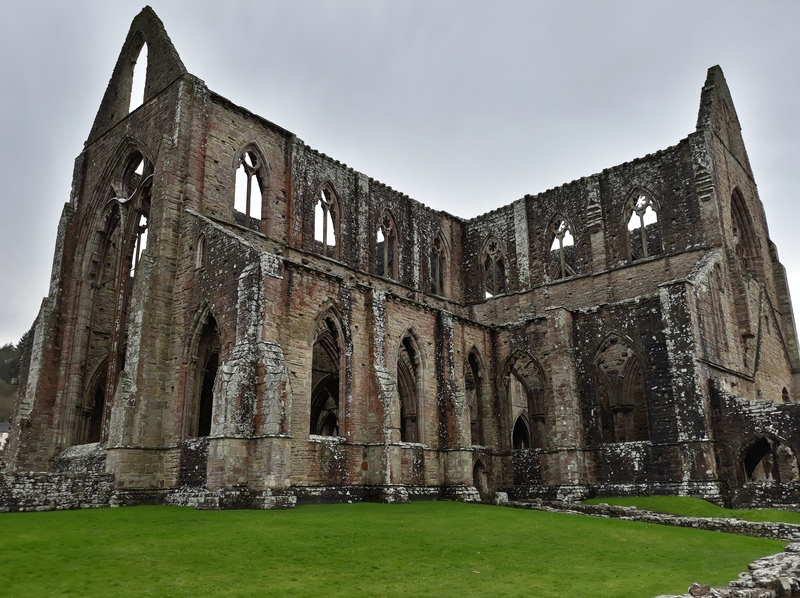 The infirmary housed the sick from Tintern village and surrounding areas, as well as their own modest population. 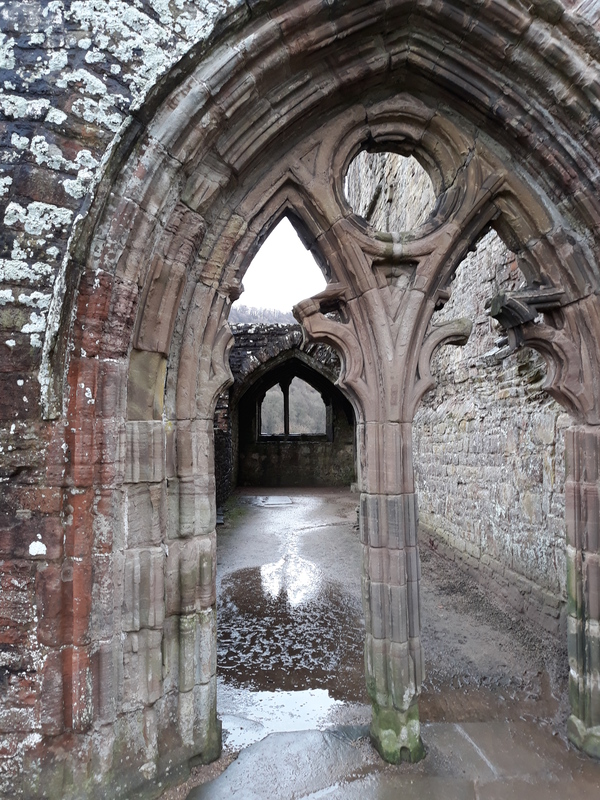 The Cistercian way of life began in 1098 when a group of pioneering monks departed from the Burgundian abbey of Molesme with the intention of leading a life of austerity and perfect solitude. Robert, their abbot, led them to settle in an area of forest and marshland and their ‘New Monastery’ was given the Latin name of Cistercium, now known as Citeaux. St. Bernard of Clairvaux was a charismatic French abbot who transformed the Cistercian Order; somewhat of an early trailblazer (and today’s equivalent of religious brand marketer), for his influence on the creation of the Cistercian identity. 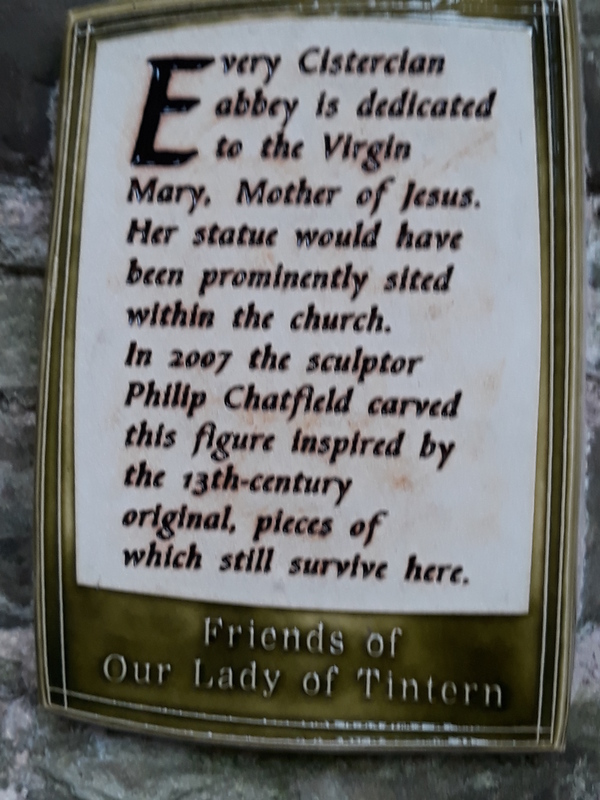 By the time of his death in 1153 there existed around 340 Cistercian abbeys across Europe, organised in a network of ‘mother’ and ‘daughter’ foundations. 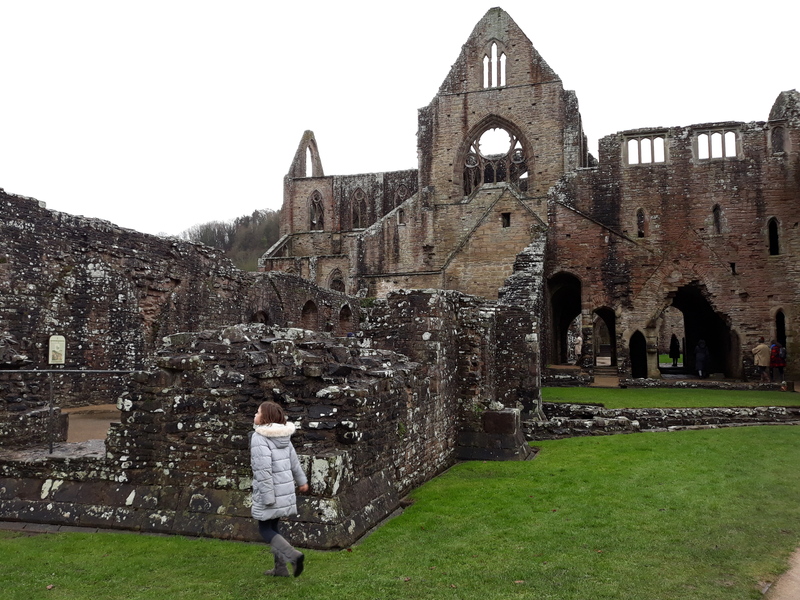 Over time there were upwards of 700 white monk abbeys across the length and breadth of Christendom, with 86 of these living in Great Britain. 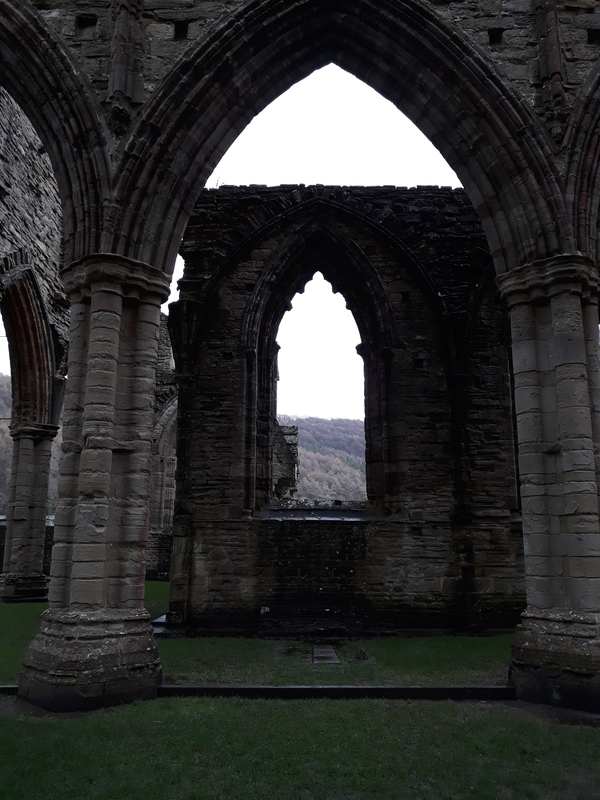 In 1165 Rhys ap Gruffudd, prince of Deheubarth gave his support to Strata Florida, and the daughter houses of Wales flourished. 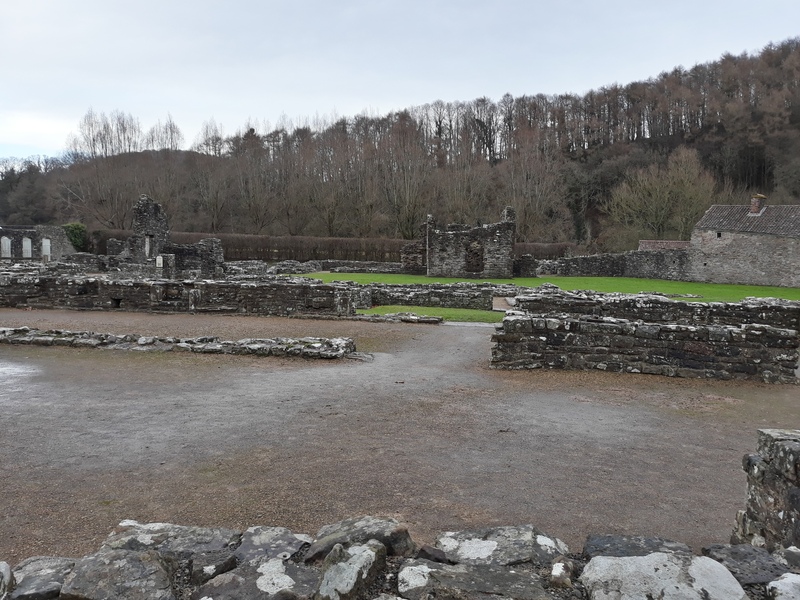 Whitland Abbey in the heart of Wales became a ‘daughter house’ of Clairvaux. 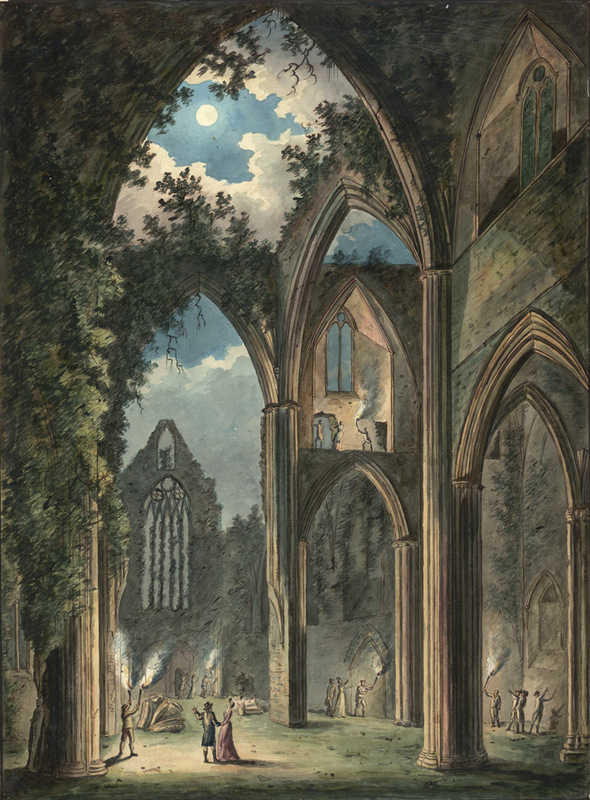 The Cistercian adventure proved to be one of the most successful and remarkable phenomena of the medieval church. Their main focus was to lead a contemplative life, a strict interpretation of the Rule of St. Benedict, with an insistence upon poverty. 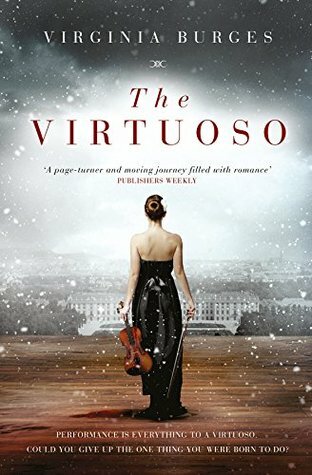 They shunned wealth and luxury and observed a rule of silence whilst living on a meagre vegetarian diet. It doesn’t sound like much fun, but in many ways it was free of the pitfalls and complications of what we might consider a modern, desirable lifestyle. They would have been men of virtuous character, living off the land, focused on their inner life and service to God and community. 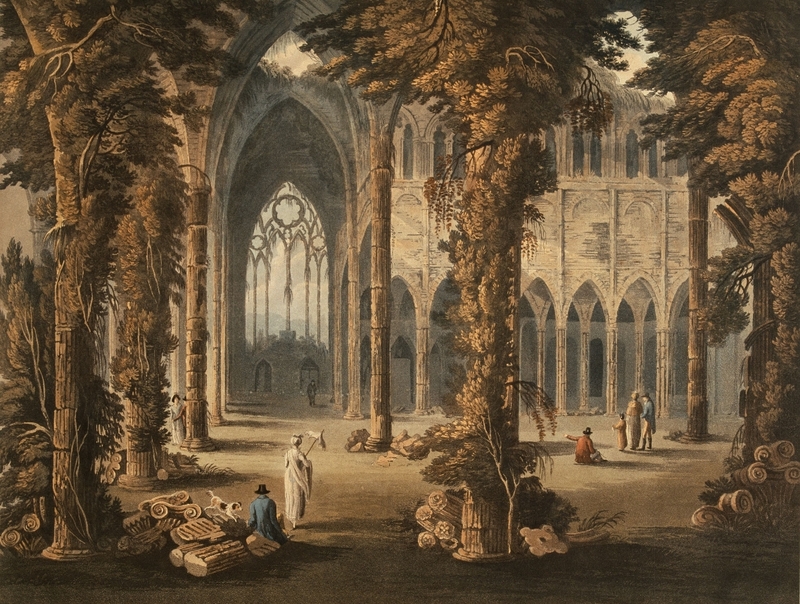 There was a grand total of three fireplaces in the whole of Tintern Abbey, one in a ‘warming room’ adjacent to the monks’ day room, one in the kitchens, and one in the infirmary, so heaven only knows how cold and drafty it must have been in the winter… or at most times of year come to think of it! Ah! rest awhile and contemplate the scene. Of man–the temple of a shorter date. 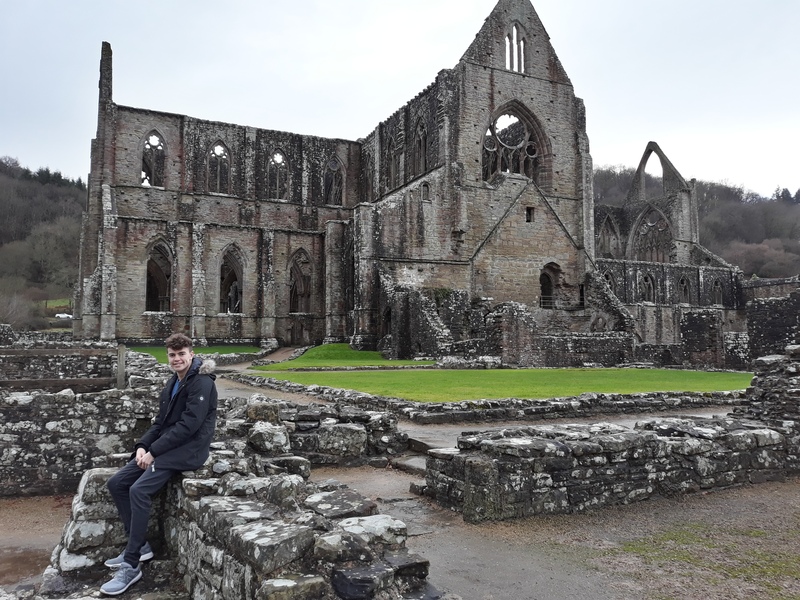 Tintern Abbey is a masterpiece of medieval architecture created in a time when construction methods did not have the benefit of modern technology and machinery, which makes it all the more inspiring. There are some stunning walks nearby at Symonds Yat Rock, where 300 million years of nature’s patient erosion has formed a breath taking river valley view and scenic woodland trails. We did a short trail as the light was fading and Emily was a tad grumpy, so progress wasn’t as brisk as usual. It was a wonderful few days to close out 2017 and see in the New Year. All blessings for 2018!